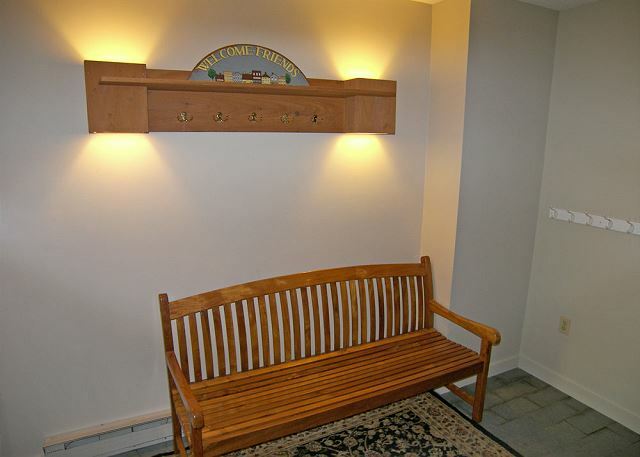 This spacious townhouse is located at the base of Clearbrook I just across the valley from Loon Mountain. With five bedrooms and three baths this five level townhouse offers plenty of room to relax and unwind. Enter to a foyer and head upstairs to the main kitchen, dining and living areas. 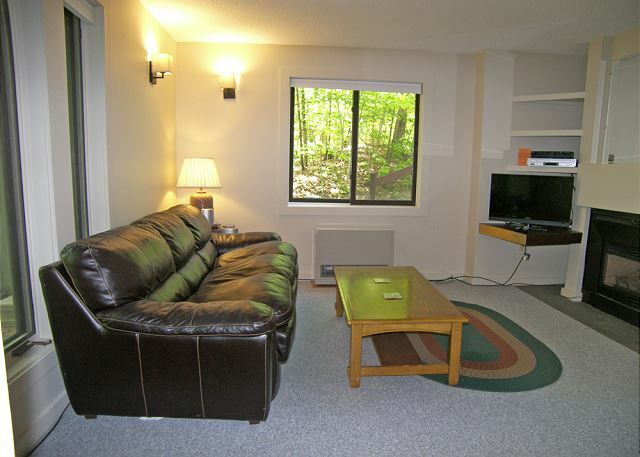 The living area offers a wrap-around leather couch, love seat, flat screen television and gas fireplace. 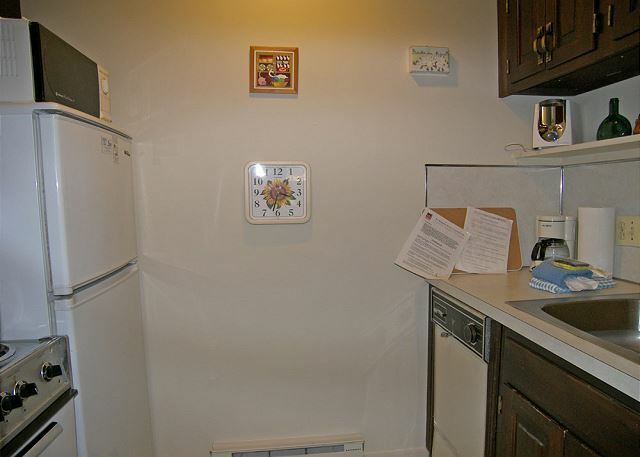 The kitchen is newly remodeled with stainless steel appliances, plentiful counter space and counter seating for six while the dining table seats an additional eight. 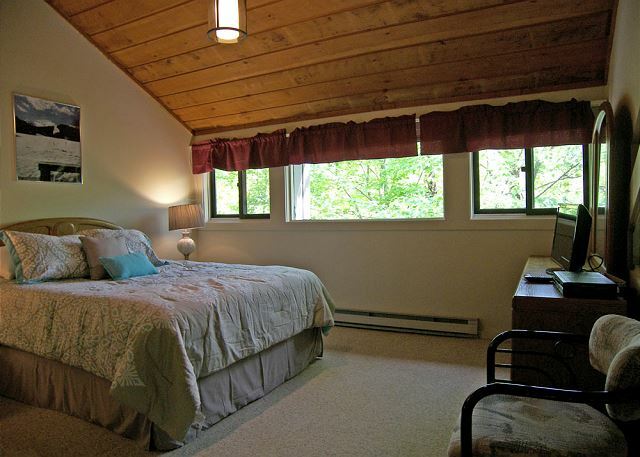 Also on this level is a full bath, a bedroom with two sets of bunk beds and access to the small deck with wooded view. 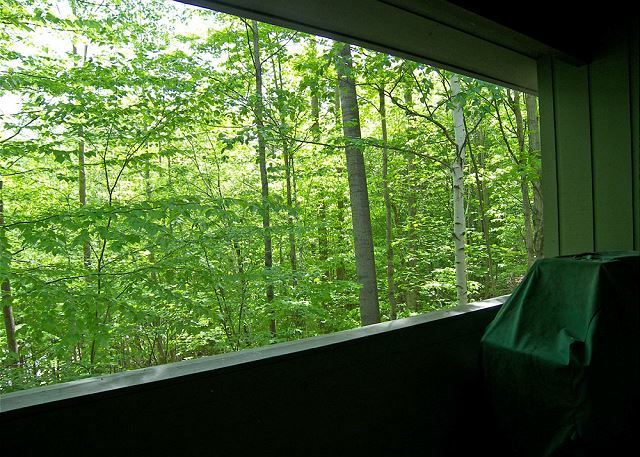 Up another level is a landing with a sitting area and the laundry room facilities. One more set of stairs and you are at the upper most level of the townhouse hosting the master bedroom with king bed, television and air conditioning; a full bath and an additional bedroom with two twin beds. Back to the entry foyer and go down stairs to the lowest level of this town house which is designed as its own small apartment with two bedrooms and a bath as well as a living, dining and kitchenette areas. One bedroom on this level holds a queen bed and television while the second bedroom offers a set of pyramid (twin/full) bunk beds. Enjoy the Village Swim,Tennis and Fitness Club with two indoor pools, two outdoor pools, three Jacuzzis (one outdoors), sauna, exercise room and 12 tennis courts for your enjoyment. 77 % of our reviewers would recommend this vacation rental. a guest from Raynham, MA does not recommend this vacation rental. Upon arrival, there was a pungent odor in the home. The rental company was responsive and came out to inspect. They did provide air fresheners, however, not the way you want to begin a stay. Property had good couch seating area and plenty of dishes. The property was very drafty. One bedroom did not get heat. Many of the outlets did not hold plugs, they would simply fall out of the socket. Property could be fabulous if a full update was completed. Thank you for your comments. We were able to track down the source of the odor, and correct it. The owner continues to work towards making this the fabulous property it can be, and many guests have truly enjoyed their stay here already. 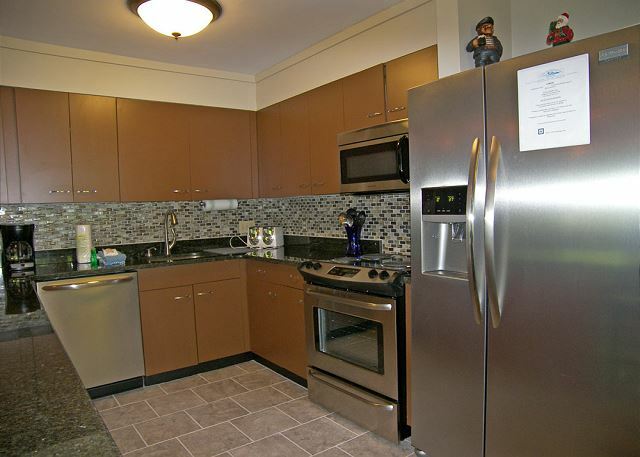 This condo worked out great for us! We were a family of 11, and had plenty of room. 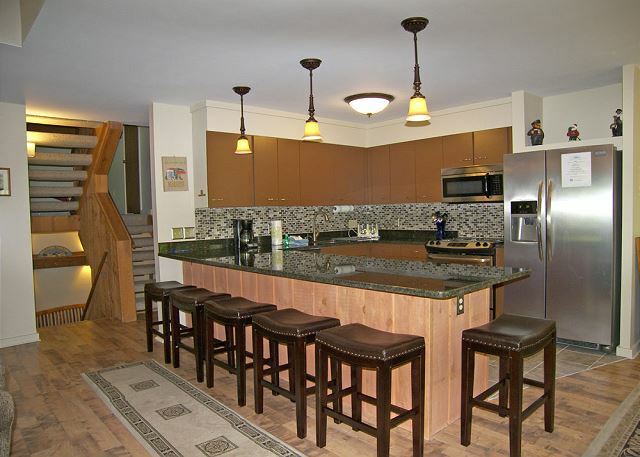 Would definitely chose this condo again when in the area. This house was perfect for our group of 12, 8 adults and 4 children. So much space and beds galore! My family and I really enjoyed the kitchen/dining/sitting room...cooking, eating and chilling together. The shuttle bus to Loon Mountain stops right outside the door and also goes to the village for folks whom might prefer a sauna/steam/dip in the pool. Over all superb experience with all the staff I was in contact with from start to finish, including expedited shipping of a little teddy that my niece left behind. I can't honestly say a bad thing about our experience:) The house was clean, stocked with towels, linens, and information on local restaurants and entertainment, and of course mountain activities. Also, a friendly suggestion to buy your mountain pass from the ladies at the place where you check in, they are super nice and lines and you get a discount!! a guest from Unionville, CT does not recommend this vacation rental. Thank you again for your candid comments. Despite our best efforts in contacting professional services about the mice, including a quarterly revisit shortly before your stay, sometimes these situations take longer to resolve themselves than others. We have purchased a snow shovel, and will check on the dustpan. We apologize again that your stay was not as it should have been and hope that the discount you received helped a little. I rented this vacation home for myself, 3 daughters, son-in-law and 7 grandkids. 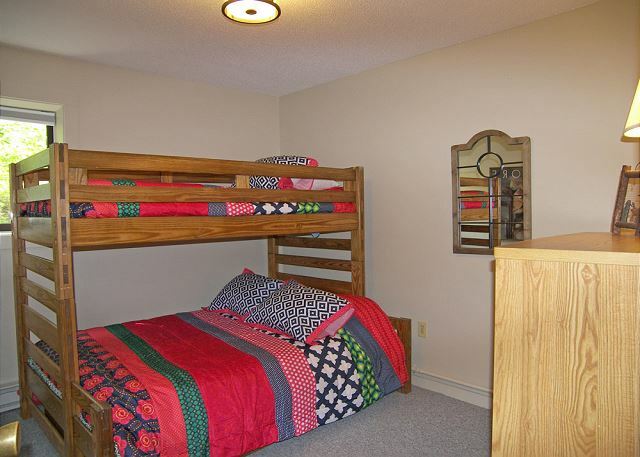 The set up of beds on multi-levels was great for us as the ages of the grandchildren ranged from 7 months to 17 yrs. The second living area downstairs was perfect for the kids to hang out separate from the adults. The house was very clean, the grill was dirty but someone was sent out immediately to clean that. My only disappointment was the balcony being very small, just room for the grill, no seating area. The lodge location was perfect for skiing. The shuttle picked up right outside and we were close to many attractions. 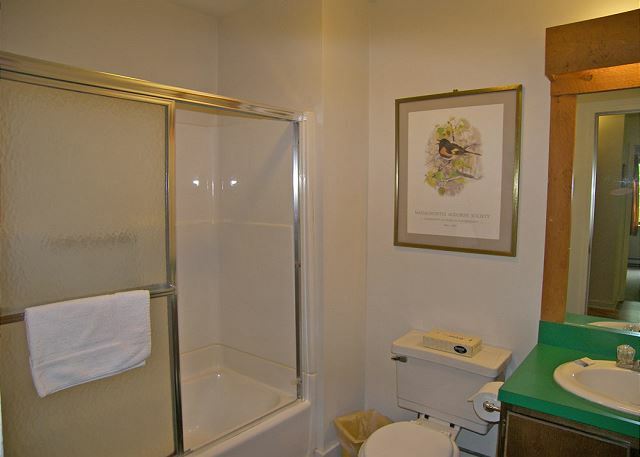 Some amenities were missing such as a hairdryer. Great accommodations and great location. Perfect for a large number of guests. Good one. Better than expected. Liked it, a little more trash bag and dishwasher detergent would be more helpful. Landmine Phone not working though, battery don't hold charge at all. 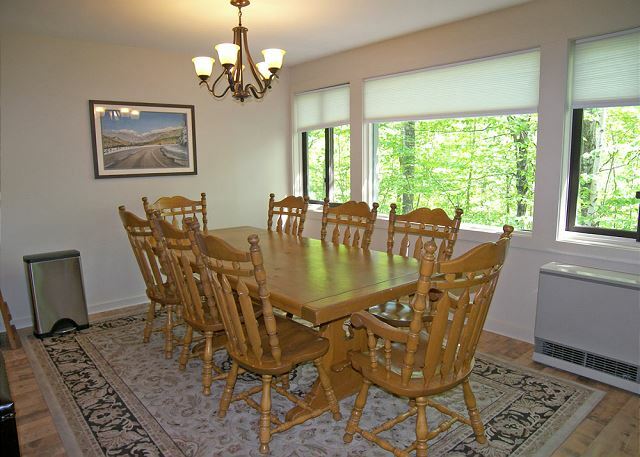 Great Location, Divided well to accommodate the 12 guests(plenty of personal space). Unit needs attention to cosmetics,(especially living,dining,kitchen) Cleanliness was top notch with what they to work with. Would recommend and go back IF unit is updated!!! Glad this home worked well for you. The owner is planning to replace the sofas in the living room this spring, so some updates are already planned. Glad that you had a fantastic time! We're glad that you enjoyed your stay. Unbelievable! Great place, highly recommended! Clearbrook 3W was much nicer than I expected. 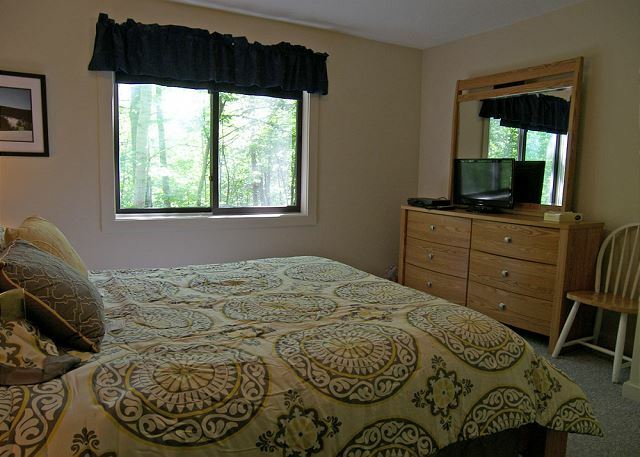 Very clean and spacious with high ceilings and enough room to fit 15+ comfortably. 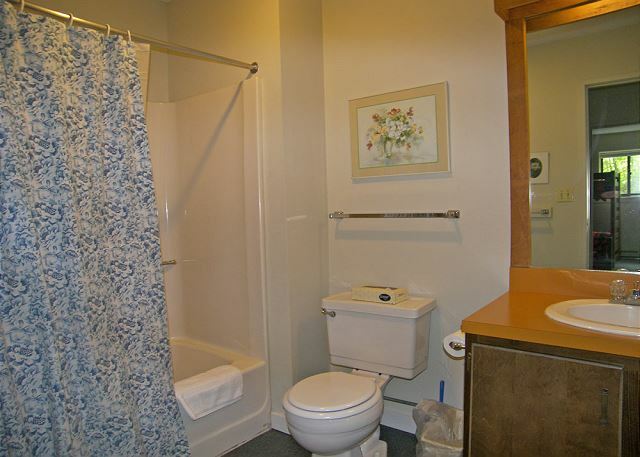 Did not encounter any problems with any of the utilities or parking situation. Location is minutes away from the mountain and the pool/jacuzzi facility was very nice. I highly recommend anyone who is interested to stay here! I am planning to do so myself. Thank you for the amazing vacation and see you next year!!! We're happy that you were pleasantly surprised! :) But this home does not sleep more than 12 people. The only way to keep it nice is to not overcrowd it and respect the owner's wishes on limiting the number of guests. Thanks! Awesome accommodation amidst beautiful place. Wish we had a long vacation. Wish you did too! It was a pleasure having you, and we hope to see you again. Stanley K from Toronto , Ontario, Canada does not recommend this vacation rental. We stayed in the same unit last year. It has the location and size we need. However, it has not been kept up. Only 1 of 4 burners on the stove function, one faucet did function properly, some screens were missing and others did not seal the window properly. The lower level was damp and uninviting. Thank you for your comments. The homeowner is thinking about replacing the stove and had done some updates in the way of flooring and televisions this spring. The very high water table this summer may have been the issue in the lower level, and we have been encouraging all of our homeowners to invest in dehumidifiers as well as the air conditioners alreday in place. We'll pass on these comments though. We are happy to see that cleanliness, location and our services made you happy. Accommodations were as advertised, not luxurious, but more than adequate. Clean in a good location. Everyone we dealt with was pleasant. The location is great, at the base of Clearbrook and right near the main entrance, however the unit itself was not in good shape. There was a small leak that affected the carpet near the washing machine, the flooring had obvious wear spots (the kitchen had a duct tape patch) and the outlets were so loose that they did not hold plugs. The furniture was not in much better shape; one of the couchs was obviously broken and the mattresses have all seen better days. 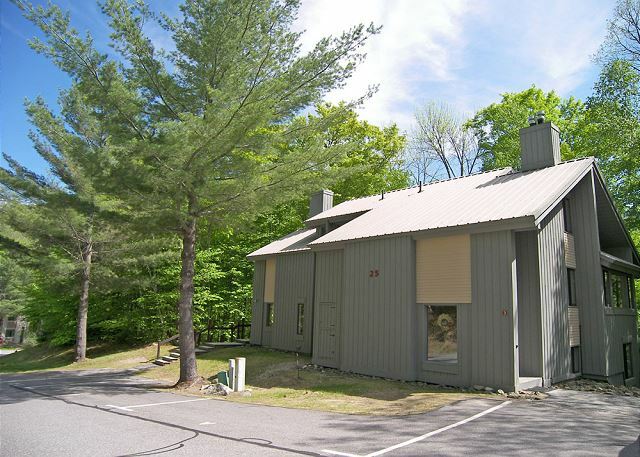 Overall, a great location in a known complex but in dire need of some updates. condo was very efficient and well located. really enjoyed our stay. Kristi M from Charlestown, RI does not recommend this vacation rental. We did enjoy our stay but felt this home was much too dated and rundown for the money we spent. the outlets in the bathrooms did not work the shared bathroom with two doors was one of the worst things i have seen. our family would not choose to stay their again. Betty C from Canton, MA does not recommend this vacation rental. We have spent several summers in this condo. 3-West is showing considerable signs of wear. Furniture cushions were torn and in bad shape. The condo was no way as clean and appealing as in past years. The football game, a favorite of my grandchildren, was broken. The kitchen well supplied in the past was lacking. The pots and pans need replacing. 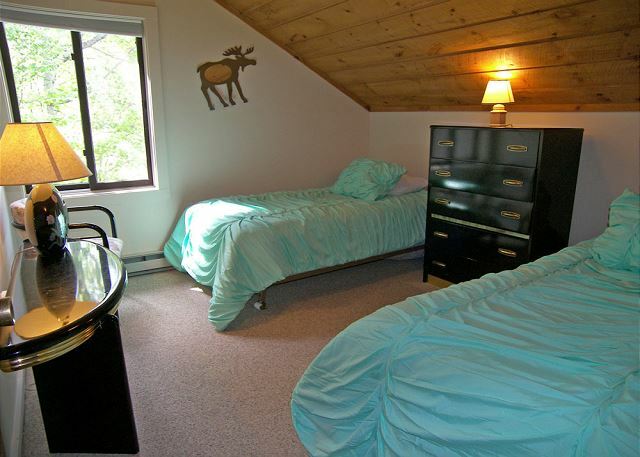 We love the location of Loon Mountain Resorts and hope they will review this rental property carefully. a guest from Brooklyn, New York does not recommend this vacation rental. The house is very spacious and comfortable for a large group. However, the furniture and appliances were very worn. The mattresses were uncomfortable. If the house would receive a refurbishing on decor, furniture, appliances (including A/C) it would be terrific. Thank you for your constructive comments. We appreciate all comments we receive. We will make sure to pass this along to the homeowner so that they know what the guests would like to see done to the townhouse. a guest from Wakefield, MA does not recommend this vacation rental. The facility was ok. It looked like it had had a quick surface cleaning, but within 5 minutes of walking with socks or bare feet the soles were black. Water pressure in the shower left something to be desired. They advertised 3 TV's. It had 3, but one did not work. 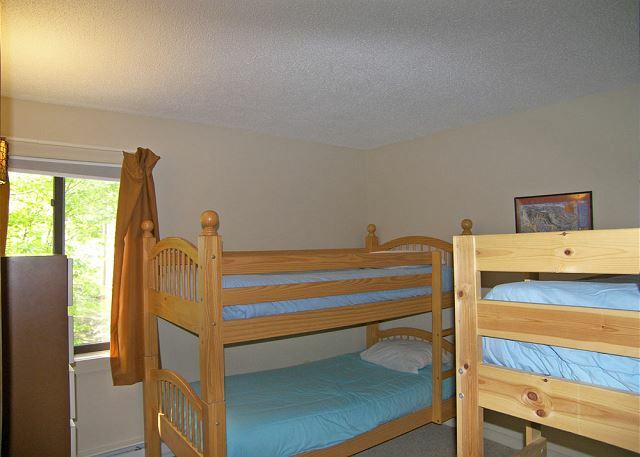 Also it said 2 bunks beds. Again it had two, but one feel apart (top bunk) and was not usable. Also at one point there was a bad sulfur like smell. I will be very hesitant to return. 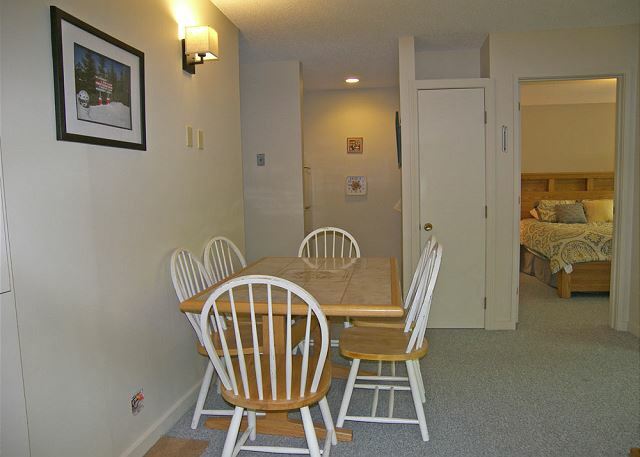 But I guess it is pretty much similar (maybe slightly less) to other ski condos we have stayed in. Just expected more for the price we payed.